My sincere apologies for the delays and inconsistencies that have affected this Mission. Unfortunately I just don’t have the time to be able to produce the pages at the quality I’ve come to expect of myself. I’m having so much fun making this issue and hope that it strikes a new high for Team Stryker in terms of storytelling and art quality. This two page spread has been in production for over a month and I couldn’t be happier with the result. Getting to draw a T-Rex stomping around downtown New York is something I always wanted to draw ever since I saw The Lost World when I was a kid. I never thought it would come in the form of a two page spread that results in Eagleheart getting hit by a subway train. You can see the high resolution of two page spread here. I’ll do my best to try and get out Team Stryker pages or at least updates on a more regular basis. 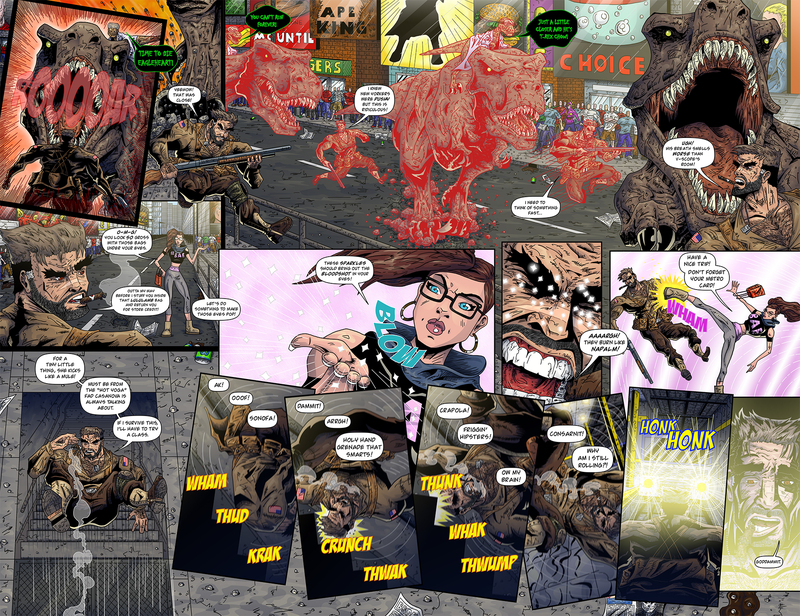 You can follow Team Stryker on Twitter, Facebook and Instagram @TSComic in between updates.